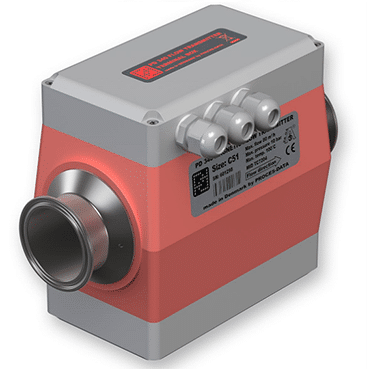 The PD 340 Flow Transmitter from PROCES-DATA is an electromagnetic precision meter for the volumetric measurement of liquids that are electrically conductive. The transmitter can be used in applications where a hygienic design is required. The PD 340 is the transducer of choice in industries where the highest standards in sanitation, hygiene, accuracy and reliability are of paramount importance. Industrial sectors ranging across the Dairy industry, Brewing Industry, Soft Drinks and Food, Animal Feeding,Potable Water, through to non-hygienic industries, where accurate measurement of a wide variety of conductive liquid chemicals isrequired. The rugged construction of the transmitter also makes it suitable for installations where solid particles are present in the liquid. Suitable for sanitary applications – Designed especially for the food industry. No moving parts – No maintenance. Volumetric measurement in m3, litres, U.S. gallons etc. Robust and compact design – Easy to mount, even in difficult applications. Factory configured to suit customer requirements. Constructed to be independent of variations in flow profile. High accuracy, even if the viscosity or the liquid changes. Change between different media liquids containing solids without any need for recalibration. Pulse and 4-20 mA outputs. Two built-in counters for totalising the volume flow. P-NET and PROFIBUS DP fieldbus communication interface (IEC 61158). Inputs for temperature sensor and digital signal. Optimised for high accuracy and linearity. Using the linearising function, it is possible to measure within a 1:100 turn down range. Therefore the meter can normally be chosen to have the same size as the diameter of the pipe work, and the cost of installation and any pressure drop can be minimised.